After the ouster of Jean-Bertrand Aristide, Ninaj put her fashion journalism assignments on hold to answer a call by the U.S. Justice Department for Creole interpreters to go to Guantanamo Bay and translate the 20-minute interviews refugees there were granted to establish their legitimate fear of persecution. Ninaj returned to Guantanamo Bay again and again, working 12-hour, 7-day weeks and gaining the trust of the refugees. Mediating among the refugees, the I.N.S. representatives, the U.S. military, and a team of law students, Ninaj helped to defuse the explosive atmosphere in the camp. She played a pivotal role in the success of a precedent-setting lawsuit that established the right of HIV-positive refugees to apply for asylum in the U.S.
Back in Brooklyn, overwhelmed by calls from the refugees to whom they had given their phone numbers, Ninaj and two fellow translators, Nicole Payen and Marie Cerat, opened their homes to women who were released in their final months of pregnancy and flown to New York with no resources or any notification of relief agencies. Scrambling to meet the needs of these women, Ninaj and Marie went to see President Aristide, then in exile in the U.S. Put on the spot when they were asked for the name of their organization, the two women founded Haitian Women for Haitian Refugees and immediately began a volunteer effort to supply the new arrivals with housing and public assistance. In May 1993, their first grant enabled HWHR to acquire classrooms in a church and hire teachers to help non-English speaking and illiterate immigrants meet the initial 90-day deadline to apply for asylum or refugee status. Forging alliances with the Coalition for the Homeless, Housing Works, and AIDS healthcare providers, Ninaj mobilized a community of activists and volunteers. 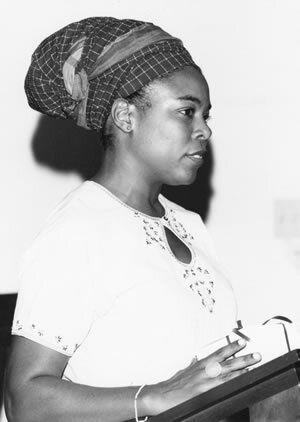 Working on a shoestring budget, she introduced information about social services into her literacy classes, provided care for the children of her adult students, and worked with the New York Immigration Coalition and the NYC Commission on Human Rights to translate legal advice into Creole. HWHR volunteers teamed up with a network of physicians, the Italian Women’s Foundation, and Women’s Outreach Network to sponsor health fairs and to provide free tuberculosis vaccinations and mammograms. Ninaj went to a 1994 Haitian women’s conference to exchange ideas with those working on behalf of refugees in Florida, the Bahamas, and the Dominican Republic. While attending a workshop on community television in 1997, Ninaj co-produced “Disorderly Conduct,” a 30-minute documentary on police brutality. In the wake of Hurricane George in 1998, Ninaj traveled to the Dominican Republic to deliver emergency supplies to Haitian plantation workers. That same year, Ninaj joined those who lobbied Congress to gain passage of the Haitian Refugee Immigration Fairness Act, which allowed about 50,000 Haitians with political asylum claims to apply for permanent residency status. Propelled by the needs of her constituents, Ninaj Raoul organizes the community to improve working conditions for domestic laborers and to reform discriminatory police policies and practices. Ninaj also encourages others to use HWHR as a platform to launch their own initiatives. A former client who organized cab drivers in Haiti is now putting his skills to work in New York and a volunteer is using HWHR computers to help high school students research and apply to college.